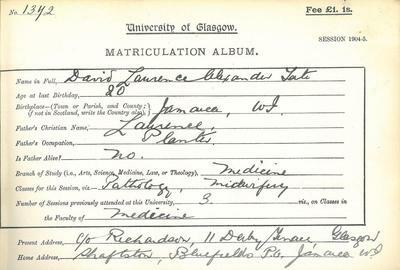 We have so far traced the University of Glasgow’s links with Jamaica to the early 18th century. At this time, Jamaica was one of the most prosperous of the British Caribbean colonies, specialising in the export of sugar and rum, commodities which relied on the use of African slave labour to work on the vast plantations run by British and Irish owners, managers and overseers. 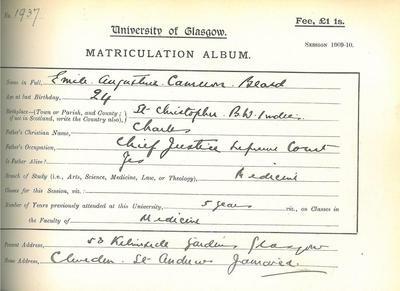 Many of Glasgow University’s alumni at that time were born in Scotland but later emigrated to Jamaica in search of work and new opportunities. 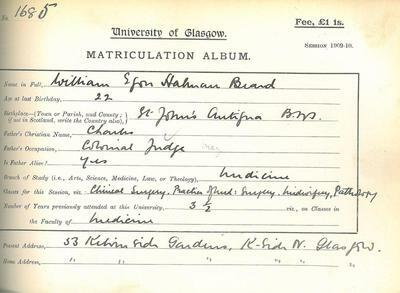 Individuals of this category include Charles Buchanan, who was born in Stirling and enrolled to train in medicine in 1743. 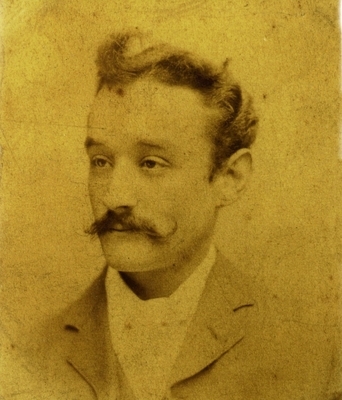 He went to Jamaica to work as a surgeon, but was swiftly overcome by the island’s harsh disease environment and died in his early twenties. More successfully, James M’Lehose was a Glasgow-born lawyer who led a long, prosperous career, first in Scotland and then in Jamaica. 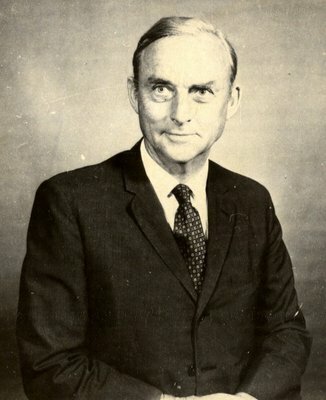 The University also educated ministers, like Patrick Hamilton, and merchants, like Ralph Fisher, who went on to work in Jamaica. 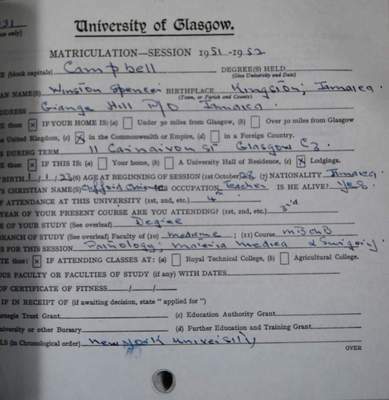 Other alumni were born in Jamaica to British parents, and travelled to Britain for their education. This was the standard practice throughout the British West Indies, which lacked much in the way of higher educational institutions. 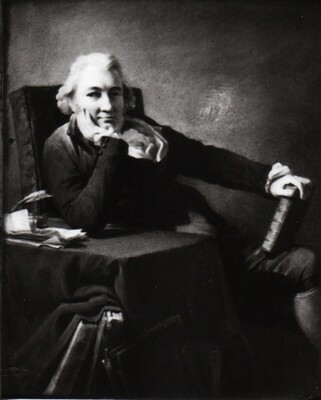 Edward Pinnock, an Arts student in 1778 about whom we know very little, was sent to the University by his father, a prosperous Jamaican merchant. 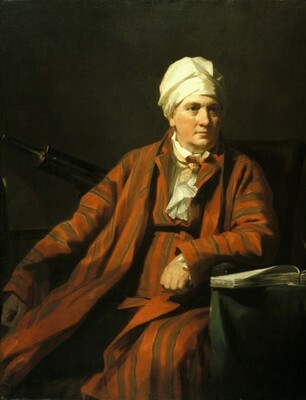 Sir Charles Henry Knowles, meanwhile, was the sole surviving son of the Jamaican governor, and received an exceptional education first at Eton and then the University of Glasgow in 1768. 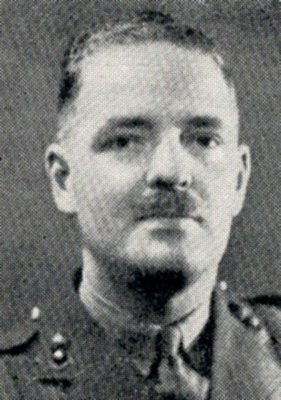 Knowles went on to lead an exciting, decorated career in the British Navy, during which he served in various posts around Britain, the Mediterranean, and the Caribbean. 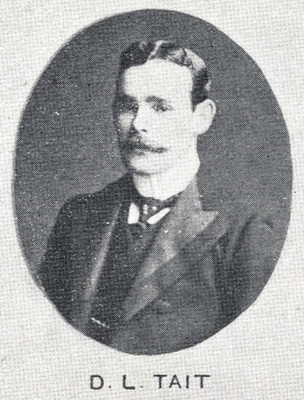 By the beginning of the nineteenth century, Glasgow’s links with Jamaica were well established. The sugar trade was thriving and much of Glasgow’s wealth came from Jamaican sugar plantations and depended on slave labour. 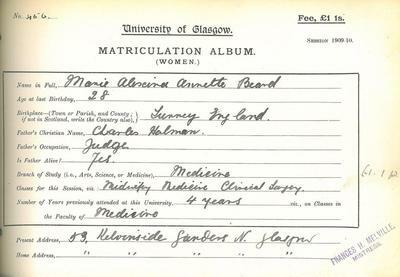 Glasgow’s merchant families had formed close business and family bonds with each other. 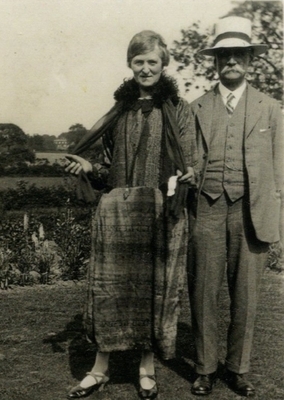 They continued the tradition of sending their sons to Glasgow University and then, often abroad, to learn about business under the tutelage of an uncle or family associate. Although a number studied for the requisite number of years to gain a degree, very few of these men officially graduated, finding it unnecessary to have a degree in order to enter the family business. Michael Scott went to Jamaica to learn the trade after leaving University. 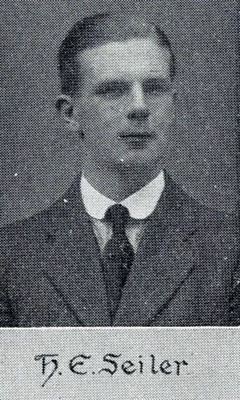 He used his knowledge of the country to write about a young man’s adventures in the navy. 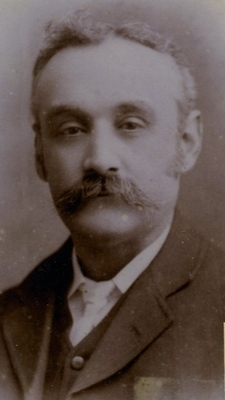 Like Scott, Robert Hamilton (details not published yet) was a member of a successful Glaswegian merchant family. He settled in Jamaica. As the Scottish owners of estates became more settled in Jamaica, they established a Church of Scotland there. James Wordie went to Jamaica around 1823 to be the minister of the first Presbyterian Church in Kingston. 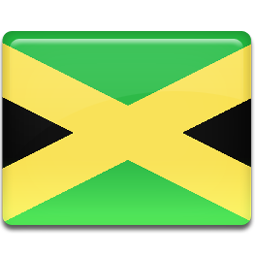 In 1807, Britain abolished the slave trade and in 1833, slavery itself and Glasgow’s relationship with Jamaica changed. Prior to this, Glasgow’s links with Jamaica were almost entirely mercantile. 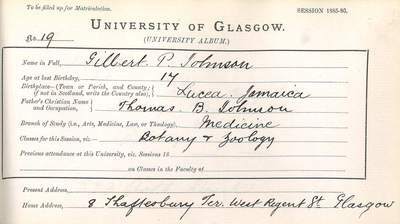 After the abolition of slavery, the University’s records show many more doctors and ministers emigrating to Jamaica: a pattern which reflects the changes in Glasgow’s economy and in the professions which the University would supply internationally. * This is the earliest graduate associated with Jamaica that we have found. There may have been others we haven't found yet, or who studied at the University but didn't graduate.